Smoking cigarettes is one of the ways you are damaging your body, by inviting long-term effects from the tobacco in it. Smoking harms nearly all the organs of the body, and there are several diseases that are caused, and there are some diseases which cannot be cured that easily. Ironically smoking is harmful not only for the smokers but also for the people around the one who is smoking, because the second hand smoking is very harmful for the health although the person might never be touching the cigarette. Below are a few harmful effects of smoking. Contribution to number of cancers – This is the worst that can happen before death, if the smoking effects are taken into account. 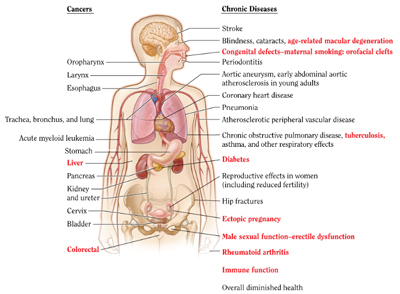 The cancers that are commonly caused in smokers include oral cancer, lung cancer (mesothelioma). Death – In the end, the worst thing happening to someone who is a chronic smoker, is death. Every year, hundreds of thousands of deaths are occuring due to diseases that are caused by smoking cigarettes. Poor oxygen supply – The oxygen supply in the body from the heart to the several organs, gets reduced when a person smokes. This is because of the slowing down of blood flow, and this can lead to heart attack and stroke, and in the long tun it could make the limbs useless and smokers end up getting their limbs amputated. Improper Breathing – Improper breathing happens because the tar from the cigarette coats the lungs from inner side and because the smoke goes into the lungs and smokers hold the smoke in for long before puffing it out, and thus, the tar collects inside the lungs and causes long term effects in breathing the air in and out. Emphysema & Bronchitis – Emphysema is one of the lung conditions that you would see common in long-term smokers, where the person would often suffer from bronchitis, and this in the end, could cause the failure of lung and heart. Smokers have a greater risk for diseases that affect the heart and blood vessels, and these diseases are categorized as Cardiovascular diseases. Here are the risks for smokers. Stroke and coronary heart disease is caused due to smoking, and this is one of the leading causes of death in United States. Early signs of cardiovascular diseases are seen in smokers who smoke five or more cigarettes per day. High blood pressure and clot formation because of the thickening and narrowing of the blood vessels, making the heart beat faster than normal. There are increased chances of developing heart and lung diseases as well as stroke for smokers when compared to nonsmokers. Here are a few compared health risks. Lung cancer by 25% in men and 25.7% in women. There are several effects of smoking on the gums, and that includes the loosening of the attachment around the tooth and in the end, lots of consequences. Check out the article on Smoking effects on gums. You need to quit smoking and only then, you would be able to see the condition of the health getting better, when you decide to give a full stop to smoking.